By the 1930’s and 40’s, Big Bear Village which was still known as Pine Knot up until 1938, has completed the transformation from a small cluster of camps into an actual village. Compare the first photo in this Big Bear Village Photo Album to the first photo in the 1920’s Photo Album. Both photos show the same view down Village Drive about ten years apart. 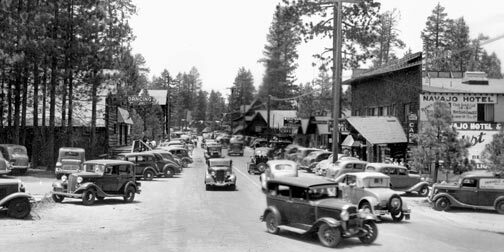 This is what a busy weekend in Big Bear Village looked like in the 1930’s. Compare this to the midweek photo below. — Rick Keppler Collection. This is the same view of Village Drive as the one above. The local residents had Big Bear Lake to themselves during the midweek. — Rick Keppler Collection. 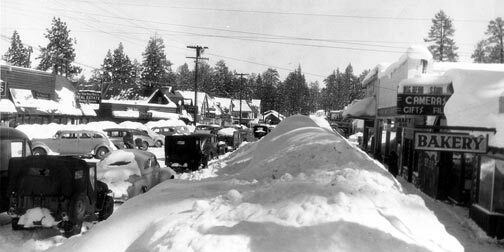 Looking east at Big Bear Village in the 1930’s Village Drive. Originally known as Heller’s, the Baird’s Department Store on the left still exists today as The Village Trading Post. — Rick Keppler Collection. Cut off from the rest of the world, the Village is snowed in until the highways to Big Bear can be cleared. Check out the ten to fifteen foot high snow burms on the left side of Village Drive. — Rick Keppler Collection. The rest of the Village photos in this album are from the 1940’s. 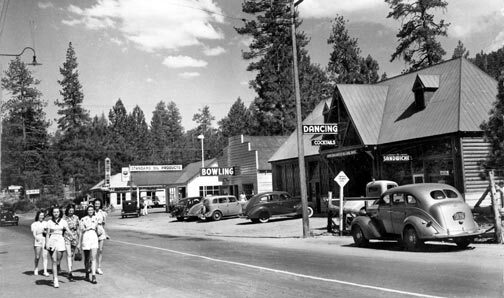 By the 1940’s, Big Bear Village was beginning to look a lot like it does today. This view of Village Drive was taken from the same angle as the 1930’s view at the top of this album. — Rick Keppler Collection. The following three photos show Big Bear Village from the west end of town looking east. Each photograph moves progressively closer to the east end of town. This view of Big Bear Village was taken about the same time as the photo above, but it looks east from the opposite end of town. — Rick Keppler Collection. Looking east along Village Drive from the Cottage Lane intersection. — Rick Keppler Collection. This third photo in this group shows the east end of Big Bear Village near the Bartlett Intersection. — Rick Keppler Collection. A busy summer weekend in the late 1940’s looking east from the Cottage Lane Intersection. Compare it to a winter weekend in the photos below. — Rick Keppler Collection. Looking east along Village Drive. The Bowling alley on the right replaced the original Bear Valley Pavilion (Village Album 1920’s & 1930’s). — Rick Keppler Collection. This winter view was taken from approximately the same location as the summer photo above. Parking along the south side of Village Drive is buried in snow. — Rick Keppler Collection. A little further down the street there is a plow in the distance trying to clear the snow burms from Village Drive. — Rick Keppler Collection. Most people aren’t aware the Big Bear Village once had an airfield. It was on the dried out lake bottom at the end of Pink Knot Blvd. Stillwell’s can be seen in the background. — Rick Keppler Collection.